The Skwachàys Lodge combined with the street level Urban Aboriginal Fair Trade Gallery use a Social Enterprise model to fund supportive housing. 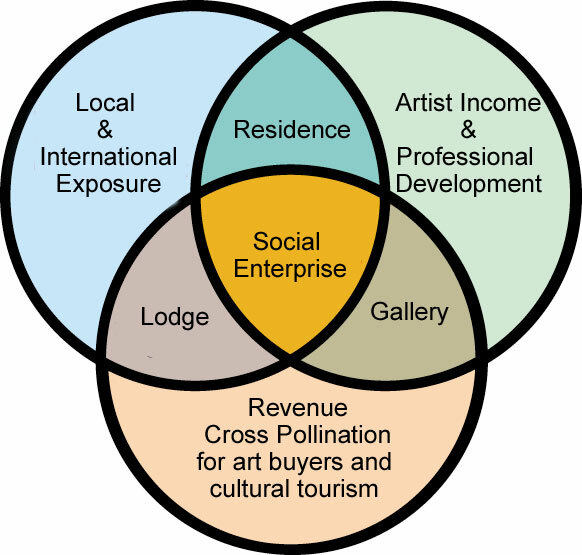 Instead of taxpayer dollars providing the ongoing monthly subsidy for 24 Indigenous artists live/work studios, the funds come from the operation of these two social purpose businesses. When a guest spends their overnight travel dollars at the Skwachàys there is a social impact – people are housed. When a guest, a member of the community or a company purchase authentic Aboriginal art at the Fair Trade Gallery there is a social impact – a simple purchase fights cultural misappropriation and ensures that Aboriginal artists are paid fairly for their work. The Venn diagram below shows how the three parts of this social purpose development interrelate, support and nourish each other. Definition: A social enterprise is an organization that applies commercial strategies to maximize improvements in human and environmental well-being, rather than maximizing profits for external shareholders. Celebrating over 30 years, Vancouver Native Housing Society (VNHS) is the largest Indigenous non-profit housing provider on the British Columbia mainland. Our original and ongoing mandate is to provide safe, secure and affordable housing to the Indigenous community. Over the years the Society’s mandate has grown to include other marginalized populations in Metro Vancouver, including: seniors and youth, women at risk, persons living with mental health issues, the homeless and those at risk of homelessness. The Society through its social enterprise practices acts as a proactive agent of change to promote community economic development and self-reliance. In recent years through our work and interaction with Indigenous artists we have witnessed the power of creativity expressed through artistic interpretation. As a result we have adopted a theme of “Community Building through the Transformative Power of Art”. That theme reverberates through every thing we now undertake. On June 11, 2012 VNHS opened the Skwachàys Lodge & Residence in the heart of Vancouver’s Downtown Eastside. The former Pender Hotel was transformed from a three and a half story completely derelict SRO hotel to a magnificent 7 floor architectural masterpiece. The never before attempted marriage of Victorian and Indigenous heritage in this structure is a source of pride and an iconic beacon for Indigenous people in the downtown eastside. On August 31st, we completed the transformation of the Lodge into Canada’s first Aboriginal Art Hotel. We invite you, your family, friends and business associates to come and have a unique Indigenous experience.